Hyderad Settings provide the highest base healing amount of any currently obtainable ring—even more than Pinnace/Argosy rings. Each Hyderad Setting provides +9.52% healing, for a total of +19.04% increased healing from two rings. This is significantly higher than the heal increase provided from Lifetic/Lifetock or Pinnace/Argosy rings. As of the Spellbound patch (October 2016), the healing on the Hyderad Setting rings has be nerfed from 5% base healing and 4.52% re-rollable healing, to 0.5% base healing and 1% re-rollable healing. Instead the Still accessory and the new Rakelith jewelry will gain “Increase Healing” rolls, making Hyderad Settings obsolete. Cannot trade. This item can’t be stored in the guild bank. Hyderad Legacy Revered or higher required for purchase. Raises max MP by 153. Increases HP recovery by 5%. Increase your healing skills by 4.52%. Increases Crit Factor by 2. 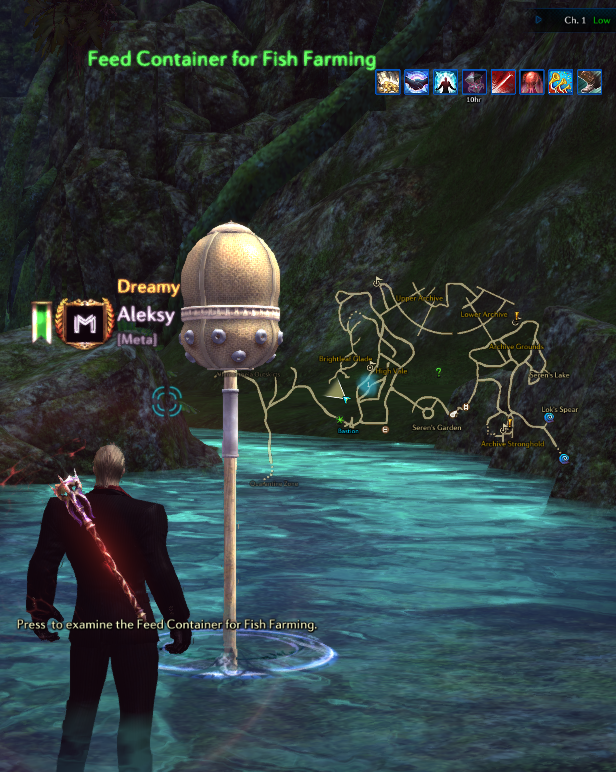 For the current TERA: Knockout patch, most healers use Pinnace (Healing) accessories. Hyderad Setting rings require a bit of grinding to obtain, but they’re the current best-in-slot rings for highest base heal amount. There are different viable accessory builds that healers can use. Often, healers build all-heal accessories, with a few healers substituting in some crit factor for more frequent crit heals. Do note that the item level for these rings is low as they are for level 60, meaning your item level can go below the requirement to receive vanguard request rewards on higher difficulty dungeons. If this happens, it’s recommended that you switch to current content patch rings before the last boss dies. If you use a Dreadnaught weapon or better and use 4 succoring zyrk/vrsk crystals, you can expect an increase of roughly about 1,862~2,263 normal healing (2,793~3,393 crit healing) at the sacrifice of 16 endurance, compared to using a Full Pinnace Set. The more healing power you have (from gear and crystals), the better the rings will scale at providing more healing power. Hyderad Settings are available for purchase via “Hyderad Legacy” credits at 1700 credits for each ring. To purchase the rings, you need to first max your reputation level (Revered) with the Hyderad Faction through daily quests. Although these rings are technically bankable, they are bind-on-purchase, so you’ll have to farm credits on the healer you want to give these rings to. Reputation accumulates until you have enough to bump up to the next reputation level. Although it should take over 2 weeks of daily quests starting from 0 reputation to max Hyderad reputation and farm enough credits, you’ll find that helping these cute popori with silly quests is worth every minute. It’s also worth noting that as your reputation level with Hyderad Legacy increases you’ll get more daily quests per day, up to a maximum of 5. ** “Revered” status is required to be able to purchase hyderad rings. Note that the Hyderad Legacy Reputation (“rep.” in the chart above) that you’ll earn through yellow quests and green daily quests is only used to increase your reputation level and is independent from the credits that you’ll obtain *only* from green daily quests. Credits are the currency necessary to purchase goods. With Revered and 1700 credits you can buy your first hyderad ring from Ermin, one of the “Hyderad Legacy Merchants” standing by the Federation Bill NPC and the teleportal in Bastion. Doing just a few more dailies will get you your second ring, and then you’re done! A 100% Reputation Boost will double the amount of rep. and credits you earn! 1. Complete all area quests in Bastion (indicated by yellow “!” and “?” symbols). Some of these will require killing BAMs, so it may help to have a DPS friend come along to help you clear the harder-to-kill ones. Once you’ve cleared all area quests in Bastion, you should be past “Suspicious” status with the Hyderad Faction. You’ll start to receive daily quests at this point. 2. Each day, you will receive a new set of randomly selected Hyderad Legacy daily quests (indicated by green “!” and “?” symbols). Complete all of these: it should take anywhere between 10 to 30 minutes per day for all these quests, depending on which quests you’re given. 3. Repeat these quests daily, and you’ll begin to get quests that give you more and more reputation points. Use the Bastion teleportal often, and keep in mind you can only enter the Lighthouse of the Sun for quests once a day. Grab all the quests first before starting any. 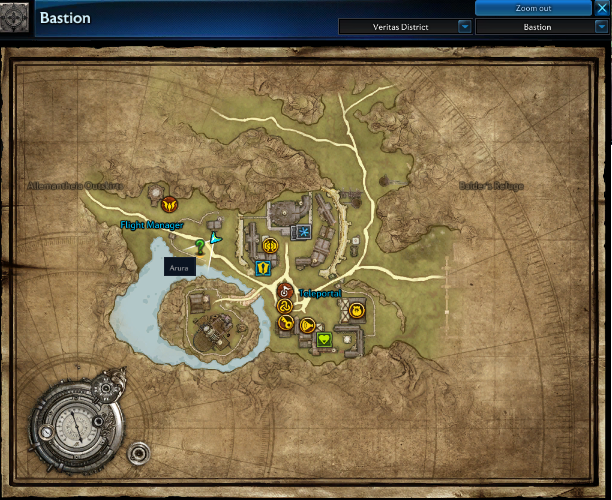 This should save you time, as many times different quests have you go to the same location. If you have one, it’s also recommended that you use your Travel Journal to save frequently visited spots such as the Lighthouse of the Sun’s entrance. Up the Creek 700 rep.
20 credits Ruma Visit Umma, and then activate the fish feeders on the streams outside Bastion. 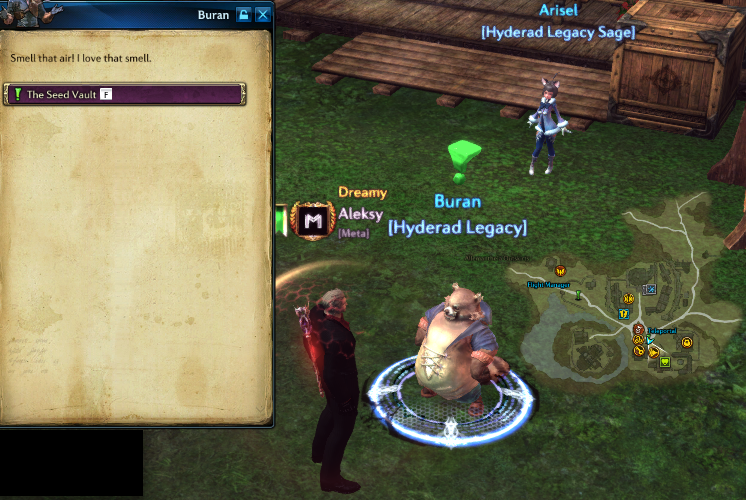 Come Mister Valkyon 700 rep.
20 credits Ruma Visit Arura, and then collect from banana trees outside Bastion. Trying to Be the Shepherd 700 rep.
20 credits Rukdi Talk to Ruma and herd a sheep back to him. A Chance of Sun 750 rep.
25 credits Akma Visit the Lilist by the Lighthouse of the Sun, go inside and restart the Ignition Device at the top. Keep Off the Grass 700 rep.
20 credits Arisel Visit Kurda, and kill the Remorseless Sentinel or Brass Warden (random). 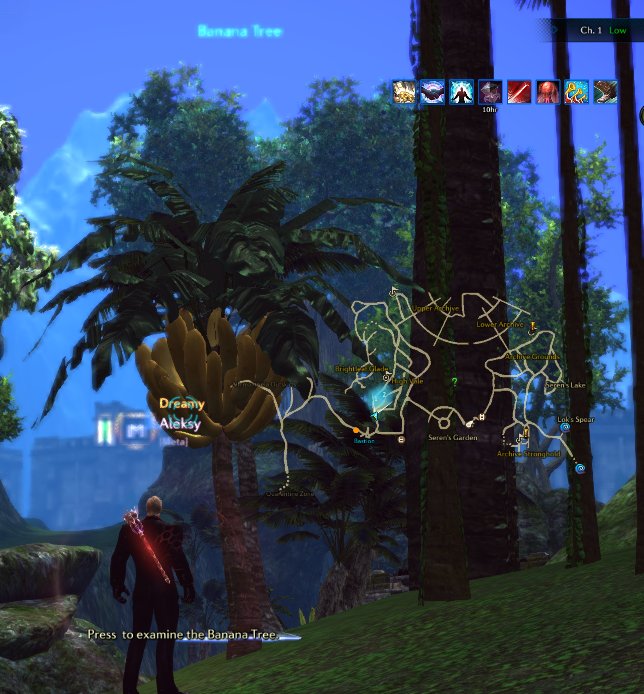 Killing Trees to Save Them 750 rep.
25 credits Arisel Visit Bahab, Kuren or Maahru (random), and then report to Meiga. First Chance to See 750 rep.
25 credits Rukdi Visit Eiru, and then guide a Baby Blue Horn Giant Toad to Eiru. Cleaning the Shed 750 rep.
25 credits Akma Meet Maun by the Lighthouse of the Sun, go inside and get the ancient legacies. Time to Rest 800 rep.
30 credits Akma Meet Maun by the Lighthouse of the Sun, go inside and kill Old Bronze Golems as you advance. You’re Not on My List 800 rep.
30 credits Akma Meet Lilis by the Lighthouse of the Sun, go inside and destroy the Old Keeper on the sixth floor. The Seed Vault 750 rep.
25 credits Buran Meet Lilis by the Lighthouse of the Sun, go inside and destroy oak barrels to find ancient seed pods. The Pause That Refreshes 700 rep.
20 credits Buran Find Ersilla, then collect a bellflower, a silver bellflower and an evening primrose, then report back to Ersilla. Nature’s Perfect Food 700 rep.
20 credits Ruma Find Arura, then collect fruit from banana trees outside Bastion. The Hyderad Setting ring has 2 rerollable lines, one of which you must roll for “Increase your healing skills by 4.52%”. The other is quite negligible, but you might aim for “Increases Crit Factor by 2” if you can spare the Semi-Enigmatic Scrolls to reroll it. As the Hyderad Setting is a level 60 accessory, you cannot equip a level 65 Vyrsk (green crystal). Instead, you’ll use either a Pristine Zyrk (level 55 crystal) or a regular Zyrk (level 60 crystal). I recommend [Pristine] Succoring Zyrks for your hyderad rings, as they give relatively similar amounts as the corresponding level 65 version of the crystal. Once you’ve chosen your crystals and rolled your new Hyderad rings, you’re all set! Hope this guide helped a bit. What accessories are you running on your healer and why? Do you think Hyderad rings are optimal for mystics/priests? Let us know your thoughts in comments below! Delsaber/Millenium (NA-HW) — For introducing me to Hyderad rings and inspiring me to get my own set of the rings. Snowfall (NA-HW) — For helping me get started with the area quests and accompanying me to some of the daily quests. Edonaru (NA-HW) — For letting me use him as a healing test subject in the demonstration video. I’ve updated this guide with some important information regarding the Hyderad Settings. Ok, but why base bonus says “Increases HP recovery” not “Increases your healing skills”? For they are 2 diffrent bonuses. They are effectively the same stat. Here the main thing is not written. You have to do this by a character who needs a ring. 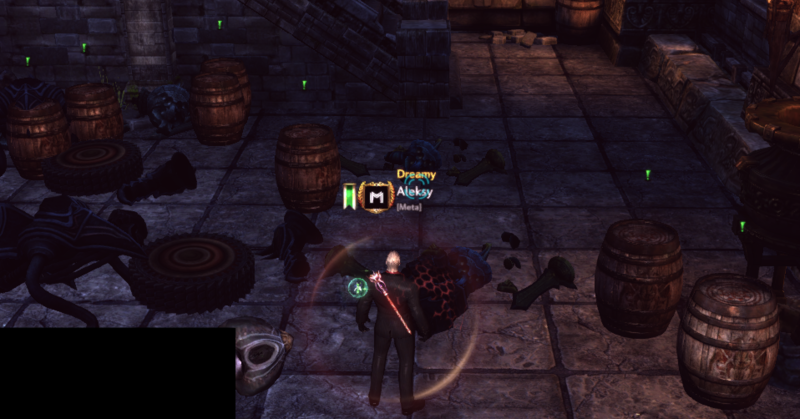 Impossible “farm” ring with u alt dps-class, buy, and give it to u heal class. Its bind when picket up. farm ONLY heal character. Ok, delete it. But .. propably u need “they are bind-on-purchase, so you’ll have to farm credits on the healer you want to give these rings to.” make BIG RED FONT. I edited it so now it should be more visible. Thanks Banim! Agreed, that’s an important thing that people skimming this could miss haha. Thanks for the pointer tal10.